The delicacy of a candlelit paper lantern hung from a spare branch or small tree. The clarity of a singular object or text pinned to an expansive white wall. These are visual sensations I particularly enjoy. Sculptors for whom I have utmost respect, in alphabetical order: Robert Grosvenor, Barry Le Va, Richard Nonas and Anne Truitt. They each articulate without unnecessary embellishment. They are succinct. Here, I have brought from my studio wall a Richard Nonas postcard from his exhibition “The Man in the Empty Space” at MASS MoCA in 2016. 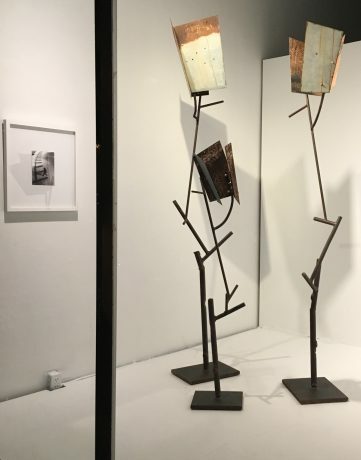 In this spare but rich exhibition in the newly formatted ‘window gallery’ at The Great Highway Gallery, David Kimball Anderson, now in his early seventies, revisits a body of work titled “Lantern/Paper”, begun in 1979 and completed in 1981, with three new pieces each simply titled “Lantern”. In the exhibition Anderson continues his practice of acknowledging artists for whom he has deep appreciation with the inclusion of a printed MASSMoCA announcement for a 2016 Richard Nonas exhibition. In the forthcoming monograph by Radius Books, “David Kimball Anderson, Work, 1969 2017”, the writer Ma Lin Wilson-Powell quotes Anderson, “My art parents are Robert Grosvenor and Barry Le Va.” In this exhibition he adds Richard Nonas to the pair. Anderson historically reveals in his work source material and other artists whom he admires. A partial provenance of the Lantern work includes: “Sculpture in California, 1975-80”, San Diego Museum of Art, May 18-July 6, 1980, curated by Richard Armstrong; the permanent collection, San Francisco Museum of Modern Art, “Lantern 1”, 1981. David Kimball Anderson was the 1973 sole recipient of the SECA Award, San Francisco Museum of Modern Art. Anderson was included in the 1975 Whitney Biennial, Whitney Museum of American Art, NYC. Anderson has been the recipient of three National Endowment for the Arts Individual Fellowships among other grants and accolades.